This is reposted from an article at DoctorHousingBubble.com. This is likely to be the first ever global economic disaster caused by real estate sponsored by big banks. During the Great Depression real estate values collapsed as the economy contracted and millions lost their jobs. That is the typical pattern of real estate bubbles bursting. Something in the economy creates a vision of a new paradigm and money starts flowing into real estate as a consequence of this euphoria. This happened inJapan as their economy and stock market frothed over with mania. There is no time in history that the entire world from the U.S. to Canada to Australia to Spain to China suddenly went into a massive trance and believed that real estate suddenly would carry the weight of every single economy forward. Of course what we are seeing is the unraveling of this system. The bubble has burst. Yet the banking system that relied on real estate as their game of choice in the casino cannot come to terms with reality because it would render them insolvent (which they are by the way). So instead, the charade continues yet the public is catching on to this mass deception. What happens when the worst housing crash since the Great Depression gets worse? There is little demand for new home sales because the public with weak incomes and an economy that is still struggling has little appetite for overpriced homes. Even if the appetite were there, the incomes are certainly not. The juice that kept the game going was debt. As we have seen with the debt ceiling bread and circus we might be reaching a limit in regards to what we can take on without adding on subsequent real growth. I know when the contraction started occurring some could not envision the correction lasting longer than a year or two. People have been conditioned to quick changes and have a hard time realizing that the housing market of the 2000s was a historical mania. That is it. It is done for a generation just like Tulip mania or any other mass delusion. The fact that home prices are now inching closer to early 2000 price levels simply does not jive with the religion many believe. 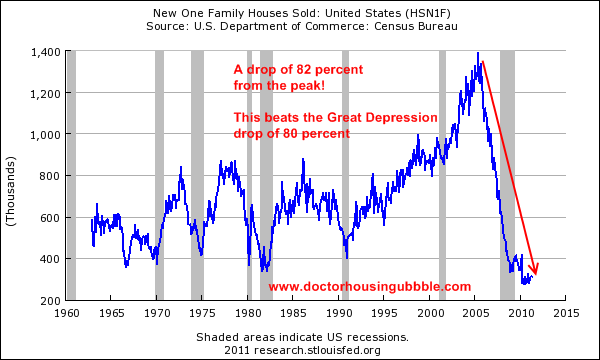 During the Great Depression, new home sales fell 80 percent from peak to trough. In this crisis we have fallen 82 percent. This is a troubling chart. 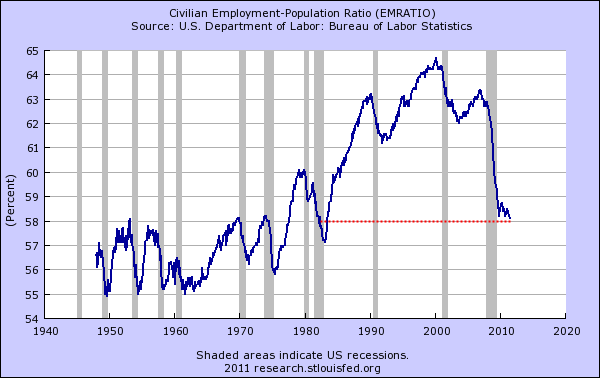 The civilian employment-population ratio is a better measure of employment success in our economy. We are now back to early 1980s levels. What is more troubling is the jump from the early 1950s on had to two with the rise of two income households. The two main driving forces for this reversal are a poor economy and demographics. How can people look at these trends and think things will reverse? Even if things do change the demographic change is built into the system. Some point to wealthy immigrants as the catalyst for rising home prices but we are unable at the moment to provide quality jobs to the masses of the unemployed. Unless we find an age reversing pill this trend is sticking around for years. There are limits in life even though Hollywood and Wall Street would like to convince people otherwise. This data is current and you can see even after major price corrections these areas are overvalued. On both coasts, these bubbles still rage but California is still the leader in bubble metro areas. Folks are delusional thinking this is sustainable. These bubbles will pop. It can happen quickly or drag out for years. The above ratios are flat out unsustainable. Just take a look at the median home price to median income ratio. This will pop. In addition, many of these areas have high unemployment rates. Take a look at San Diego that nearly has a double-digit unemployment rate for the county. What is important to also note is that these prices have already fallen by 10, 20, and even 30 percent in many cases from their peak. They are still inflated. The shadow inventory in these markets is dramatic. At a certain point reality will need to be faced and when that day comes, you will see prices moving lower. That is the only way out or we can grow household incomes and double it in the next few years but do you see that happening? I would love to see evidence that our financial system would reward productive behavior instead of putting all the money into the hands of the banking system that largely operates like a vampire on the productive side of the economy. We do need banks, but investment banks should be spun off and allowed to make their own non-systemic destabilizing bets. At the moment the financial system is simply looking for ways to pilfer funds from the majority of Americans. If they could find a method to profit from slamming Americans lower they would do it. Many a hedge fund made billions by gambling and speculating on the failure of American homeowners. So what happens next? It is an interesting side note that during the typically hot summer selling season with mortgage rates at all-time lows that home sales are weak. Why? At a certain point it boils down to income. Many that have their brains cleansed by the 1984 media machine think that just because many people have luxury cars or dress a certain way they are wealthy. They are not. The data does not back up this phony studio set and many are starting to realize that the financial Wizard of Oz is more smoke and mirrors than anything real or tangible. Certainly there is tremendous wealth in the country but not enough to support entire metro areas with inflated prices. Just because the mainstream press isn’t reporting this next bubble bursting doesn’t mean it won’t happen. Heck, they didn’t start talking about the most obvious housing bubble in generations until it blew up in their face.